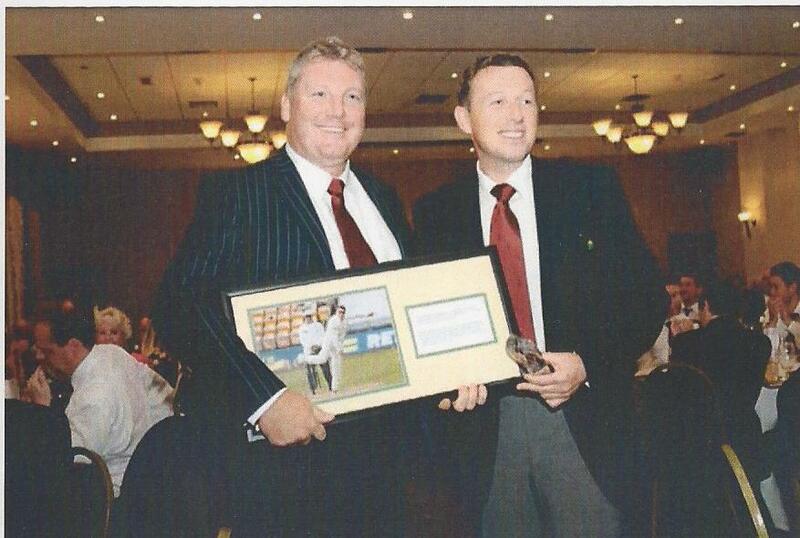 The Balconiers’ Annual Glamorgan Players Presentation Dinner is always a highlight in the calendar, but it is fair to say that the 2012 event, held at the Towers Hotel on September 17, reached new heights as it had the added dimension of providing an opportunity to celebrate the Balconiers’ successful efforts over 40 years to maintain county cricket at the historic St Helen’s ground. As a result of this landmark achievement, attendance easily exceeded the 200 mark and we were honoured with the presence of a number of high profile guests including the Glamorgan President, David Morgan and his wife Ann; Glamorgan CEO, Alan Hamer and his wife Sadie; Glamorgan legends, Balconiers’ President Don Shepherd and former Glamorgan England Captain Tony Lewis. It was also gratifying to see good representation by many former Glamorgan players. Also present was Council Leader David Phillips, Councillor Ryland Doyle and members of the Council managerial staff. The event also gave the Balconiers an opportunity to say a heart-felt ‘Thank You’ to our loyal corporate sponsors, who, even in the face of trying economic times, continue to provide generous support for the Swansea and West Wales Cricket Festival year in year out. The atmosphere at the event was something special to be savoured with the current playing staff, club officials and Balconiers’ members mixing freely before dinner was served, no doubt reminiscing and treading the well worn path of ‘memory lane’. This was no doubt aided by the montage of St Helen’s memories expertly compiled by Andrew Hignell, and which provided a very appropriate back-drop for the countless cricketing conversations. Edward Bevan – who marked 30 years as BBC Wales cricket correspondent and who is Wales’ ‘voice of cricket’. Hugh Davies – who celebrated his 80th birthday and thus was an opportune time to recognise his contribution to Glamorgan cricket as player, committee member and Deputy Chairman. Richard Bentley – to mark the publication of his St Helen’s anthology depicting the cricketing history of the venue. Mair Williams and Dilys Lewis – for their unstinting work at Fred’s Bar during the Festival. 2013 was the benefit year of Mark Wallace, Glamorgan’s (club and four day cricket) captain and wicket-keeper. Mark and his benefit committee planned a number of events throughout the year to raise money for Mark’s chosen charities. 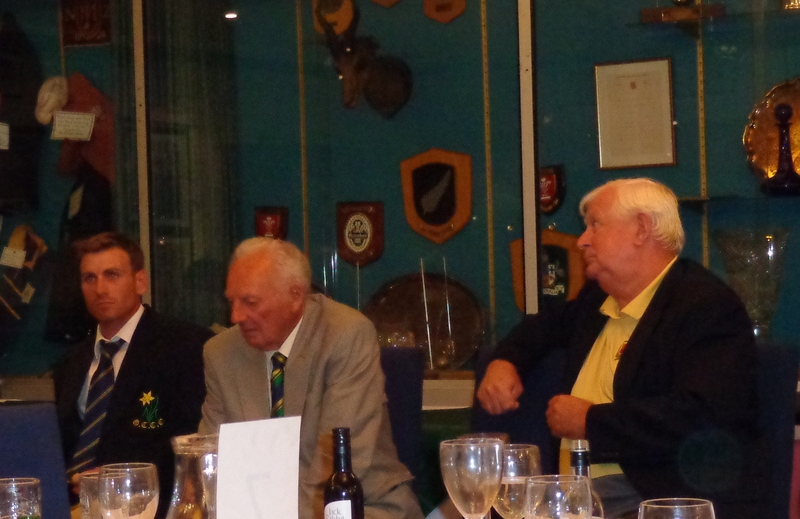 One of these was an evening buffet during last year’s festival at St. Helen’s at which Glamorgan past-players Malcolm Nash and Don Shepherd spoke with Mark. Along with golf events, cycle rides, quizzes, cricket and more, the programme of events culminated with a luncheon in November at The Towers Hotel, Swansea. Mark Wallace made his Glamorgan debut in 1999, becoming the club’s youngest ever wicket-keeper in the process at the ages of 17 years and 287 days. In 2001, he became Glamorgan’s regular four-day keeper and was awarded his County Cap two years later at the age of 21. You can find further information on Mark’s career on his page on the Glamorgan CCC website by clicking here visit or on Cricinfo. Robert Croft’s retirement from first-class cricket at the end of the 2012 season was marked with a Special Award presented by Glamorgan President David Morgan OBE. Croft also received a cheque for £1,250 from the Balconiers in recognition of his Testimonial Year. 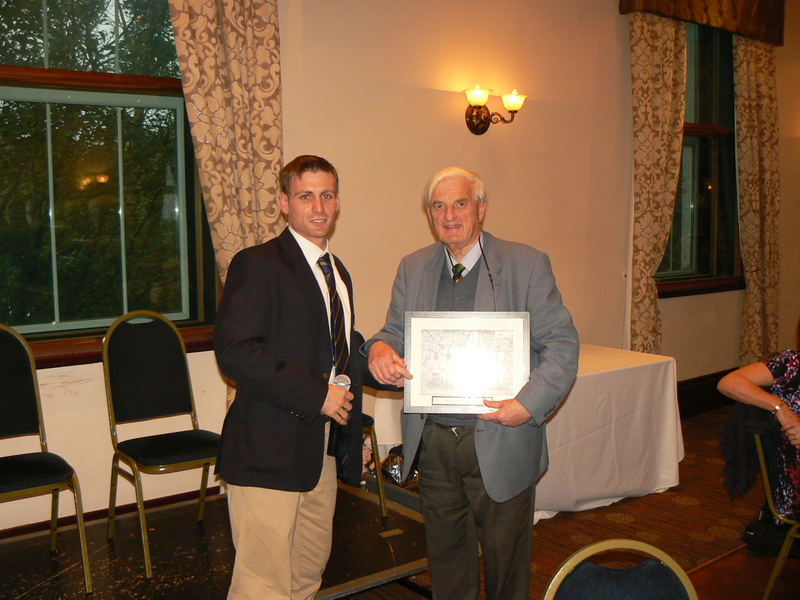 The main award of the evening was the Balconiers’ Glamorgan Player of the Year, and this was presented to James Allenby to mark his all-round performances in the course of the season. James scored 712 runs over the LV County Championship season at an average of 41.88 with a best score of 125 and also was an effective medium pacer capturing 38 wickets at an average of 24.95. 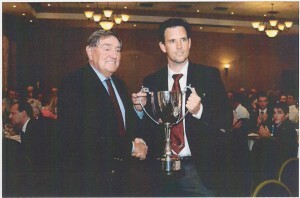 Jim Allenby was presented with the Perpetual Cup as Balconiers’ Glamorgan Player of the Year 2012. 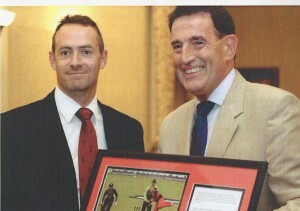 Captain Mark Wallace received a Special Award in 2012 as the highest-scoring specialist wicket-keeper in Glamorgan’s history. Dean Cosker received a Special Award for achieving his 500th first-class wicket for Glamorgan v Essex at SWALEC, May 2012. 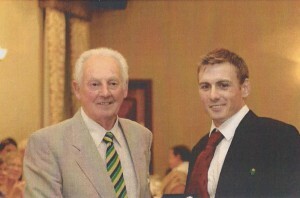 John Glover received the Gerry Munday Award for most improved Glamorgan Young Player of the Year 2012. Robert Croft was presented with a Special Award for his 50th 5-wicket performance v Essex at Colchester in August 2012. 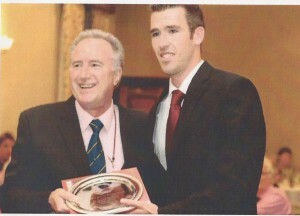 Huw Waters was presented with a Special Award for his career –best bowling performance (7-53) at the SWALEC in April 2012. 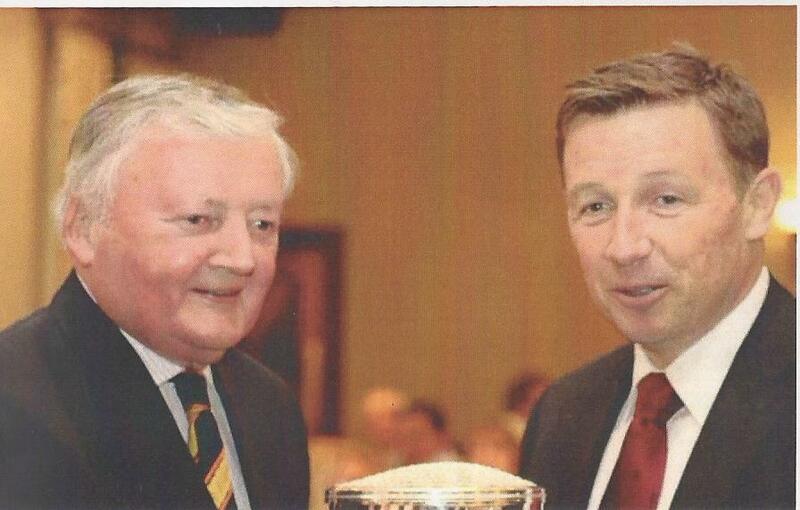 Allan Gray Presents Huw Waters with his award. 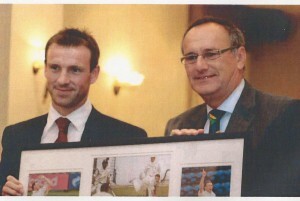 Chris Cooke’s career-best 137 in the CB40 game against Somerset, at Taunton, was marked at the 2012 Awards. David Lloyd – Glamorgan’s 2nd XI Player of the Year (David also made his 1st-class debut towards the end of the season). Chris Cooke – for his career-best of 137 in the CB40 game against Somerset at Taunton. This is the 4th highest individual score by a Glamorgan batsman in the competition’s history − it came from 112 balls and included 11 fours and 4 sixes. The final award of the evening went to our own Chairman, John Williams, in recognition of his service to the Balconiers over the full 40 years of the organisation’s existence and latterly of course for a number of years as its Chairman. 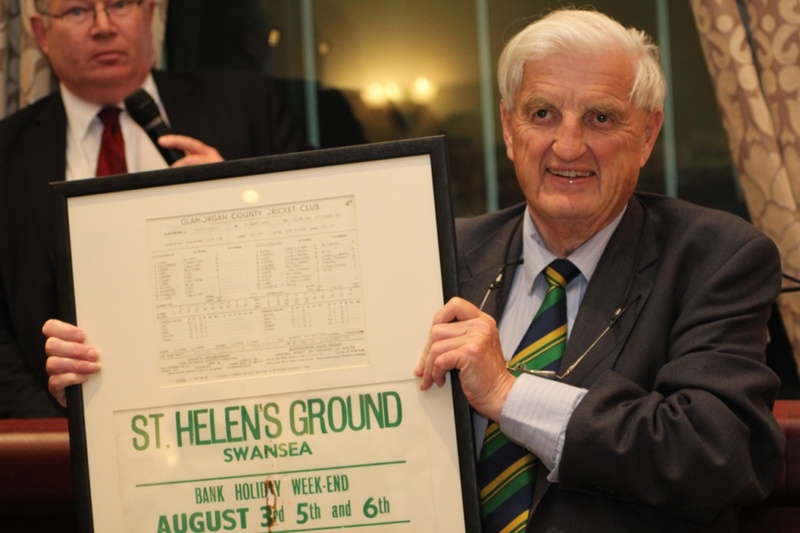 Totally taken aback, John was presented with holiday vouchers, a camera, binoculars and a framed poster advertising the Glamorgan v West Indian tourists match that was played at his beloved St Helen’s in 1963. Quite appropriately John was also awarded a lengthy standing ovation. It’s appropriate to end with an expression of thanks to Andrew Hignell for his invaluable assistance in providing the statistical information.